Mentor Teachers train and guide high school and college students toward become effective teachers. Through lesson plan feedback, classroom observation, debriefing, and professional development workshops, Mentor Teachers are our teaching fellows’ first coaches as they learn how to teach for the very first time. Each year we hire Mentor Teachers to work closely with each other and the program’s Directors in supporting teaching fellows as they plan and teach 7th and 8th grade curricula with low-income, academically motivated middle school students in Providence Public Schools. Summerbridge 2019 We’re hiring four Mentor Teachers – two English and two Math – to work closely with each other and the program’s Directors in supporting 24 high school- and college-age teachers as they plan and teach 7th and 8th grade curricula with low-income, academically motivated middle school students in Providence Public Schools this summer. Learn more about the position in the Mentor Teacher Job Description. Applications will be accepted until all positions are filled. School Year Program 2019-2020: Please check back in September 2019 for the 2019-2020 school year application. Questions? Contact Marisa Chock, Co-Director at (401) 528-2152 or mchock@breakthroughprovidence.org. The Dean of Students supports middle school students and their young teachers to become effective problem-solvers Through individual and group problem-solving sessions, classroom observation, debriefing, and implementation of restorative practices, our Dean of Students ensures our community is a positive, safe, and empowering place to teach and learn. Learn more about the position in the Dean of Students Job Description. The application process for Summer 2019 is open. To apply please submit a cover letter and resume to apply@breakthroughprovidence.org. Questions? Contact Adam Rodriquez-Dunn, Program Director for Student and Family Engagement at (401) 528-2110 or arodriquezdunn@breakthroughprovidence.org. The Operations Director supervises two Operations Associates and many volunteers to ensure that all the behind-the-scenes administrative functions for the Summerbridge Program (transportation, meals, event logistics) run smoothly. The application process for Summer 2019 is open. To apply please submit a cover letter and resume to apply@breakthroughprovidence.org. Questions? Contact Carlon Howard, Co-Director at (401) 528-2127 or choward@breakthroughprovidence.org. Operations Associates work under the supervision of an Operations Director to ensure that all the behind-the-scenes administrative functions for the Summerbridge Program (transportation, meals, event logistics) run smoothly. The application process for Summer 2019 is now open. Questions? Contact Carlon Howard, Executive Director at (401) 528-2127 or choward@breakthroughprovidence.org. Volunteers work to ensure that all the behind-the-scenes administrative functions for the Summerbridge Program (transportation, meals, event logistics) run smoothly. Volunteering is a great way to achieve community service hours, belong to a fun and supportive community, learn valuable leadership skills, and explore teaching as a career. Questions? 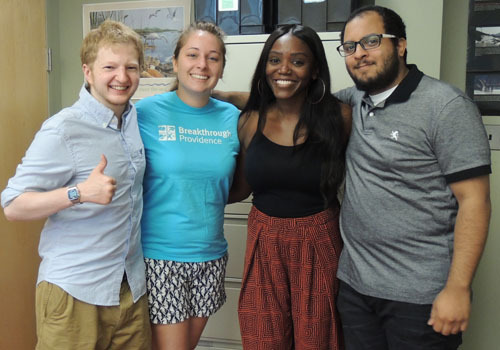 Contact Niimo Nix, AmeriCorps VISTA, Development Associate at (401) 528-2257 or nnix@breakthroughprovidence.org.